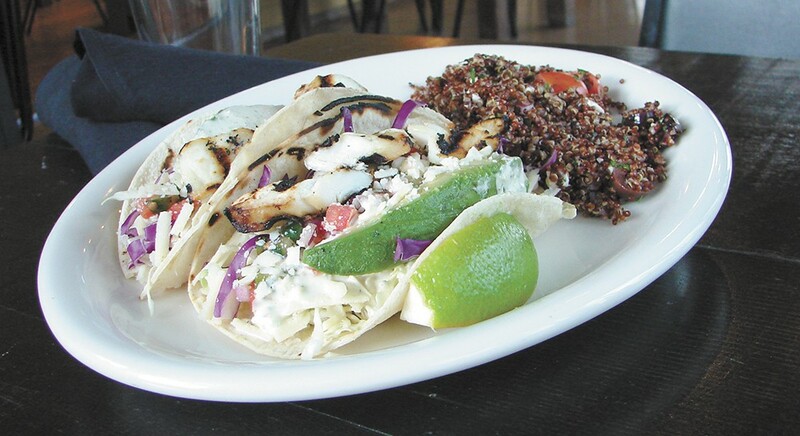 Fish tacos are just the begining of the electic menu at Loaf & Ladle. It's the perfect location for a restaurant: one block off Sandpoint's busy main thoroughfare in a converted house with a large, partially shaded porch and plenty of seating. In fact, at the corner of Second Avenue and Lake Street, the new Loaf & Ladle restaurant has been home to several prior restaurants, most recently the Neighborhood Pub. What distinguishes Loaf & Ladle is its emphasis on fresh, from-scratch cooking with service from early morning through late evening and a pleasant range of eclectic dishes, ranging from spicy Jamaican twice-cooked tofu ($16) to Lamb Souvlaki ($14) to the Roasted Veggie Muffuletta sandwich on grilled focaccia bread ($11). Their breakfasts feature eggs from owners Sarah and Michael Williams' pastures for dishes such as the huevos rancheros ($13) or "Benedict" with choice of prosciutto, cedar-plank salmon or veggies ($13). Other breakfast options include chicken and waffles, which shouldn't work, but does, combining salty, bacony-cheddar waffles with the sweetness of maple syrup ($16). Also try Sarah Williams' cinnamon roll, baked fresh daily ($6) with a cup of local Evans Brothers coffee. Red Wheelbarrow produce and Litehouse salad dressings are featured in lighter fare, such as the kale Caesar ($10) and the Root salad with roasted beets, butternut squash, sweet potatoes and carrots over greens with feta cheese and pistachios ($14). For dinner, try marinated and grilled sockeye salmon with herb vinaigrette from Thunder's Catch ($18) or grilled Flank Steak served in an open-faced sandwich with Gorgonzola, roasted tomatoes, caramelized onions and arugula ($15).